The career is organized around what we call Cycles, that is, the different roles and jobs you have during your professional life. There is not a magic number of years you should stay in one job, but the time you spend in each place is meaningful in terms of building up your professional profile. You will need to make decisions and then execute without looking back. Once you feel the cycle is completed, you will evaluate if the job has fulfilled your expectations, and continue down that road or change course. If you are a recent graduate, it is not a surprise if you change job as you try to figure out what you want to be. Later, recruiters tend to look for consistency. The average number of years that workers stay with their employers has decreased during the last decades but changing professional role too frequently will not be positive for your job interviews. When you start in a new job, it is not advisable to abandon or seek a change when the first setback appears. You learn a lot from difficult situations and it is advisable to stay on track during a reasonable period of time, unless there is an exceptional circumstance that advises otherwise. It is normal that our preferences evolve as our circumstances change and we understand better the labour market. 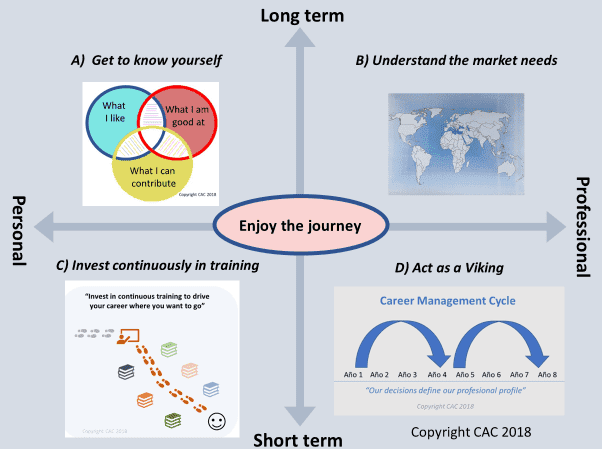 Professional cycles can have very variable durations depending on a lot of factors, but usually the standard tenure can be estimated between 2 and 4 years, although it is understandable that there are circumstances in which it can be very different depending on the sector, career path, personal events, etc. On top of what we are, we need to position our Personal Brand and work on how our CV is perceived to improve our access to interviews. The concept of brand applied to the labour market has experienced a great boom with the Internet. Years ago, the only information an interviewer had before knowing a candidate was his CV. However, companies can now "google" your name and easily find all the information available on the web. Internet is an opportunity for all candidates to make themselves known in different ways. It is important that the information that appears in Social Media is consistent with your CV and reinforces the messages you want to send. Many people have a good part of their CV available through social networks. For example, on Linkedin, Facebook, Pinterest, Instagram or Twitter you can get a lot of information about people´s careers and interests. We are arriving to the end of the Viking Rules. Remember that knowing what your preferences are and having a good map of the labour market will help you define your plan to end up in the place where you fit best. If your plan is not realistic, you will start to feel stress and frustration, which are symptoms that should make you review your goals or the map you have in mind. Your efforts and plan should be in sync with the market so your career can flow smoothly. Maybe a coach or a friend with more experience than you can give you advice to make sure you have a good understanding of the labour market, complete your professional cycles and have a good Personal Brand to find your place in the labour market.